Is your agent working for you? Ask them these questions, and see! If your house has been on the market for more than three months, there are some questions you need to ask your estate agent to find out why it hasn’t sold so far, and what to do about it. A good agent will be able to answer all seven – let’s see how many your agent can answer…..
1. Who have you sent our brochure out to? – to what kind of buyers? How many had asked specifically for your property details, and how many had been sent out to their mailing list? How many did they print, and how many do they have left? Sometimes, agents won’t reprint when they run out, preferring instead to keep costs down by printing off the office printer – tacky! 2. Can you show me our Rightmove Performance Report and your analysis? – (see blog post Your Rightmove Property Performance Report) Most agents these days can provide you with one, but can they analyse it? If they can’t – send it to me! [email protected] – I’ll tell you what you need to know. 3. Can you change our main image and test the results? – if your online activity is low, I’d suggest you change your main house shot. However, this is only useful to you if you can then measure the results. If it doesn’t improve your statistics, try another, and keep trying until you get the click-through rate you need (see post as above). Sometimes, a fresh new image improves your rate temporarily, so try changing it regularly to keep your results as high as possible. 4. What did our viewers buy? – this is a great one! Your agent should be keeping in touch with your viewers to discover what they eventually went on to buy. By doing this, you can build up a picture of the types of buyers looking at your house. For example, if they went on to buy a completely different style of property, it could be that your marketing is appealing to the wrong target market. If they bought somewhere very similar, you need to compete better. Even the best agents need nudging to find out this information, so nudge! 5. What’s happening on any comparable properties? 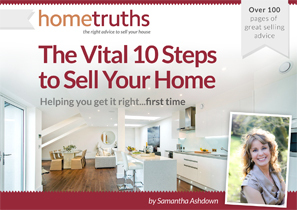 – who is achieving viewings, and who isn’t? Which houses have been reduced in price, and has this made any difference? Which are under offer, after how long, and at what kind of value? If you aren’t getting viewings and everyone else is, ask why! 6. How do you think our marketing can be improved? – ask your agent for a marketing review, and analyse as dispassionately as you can, your brochure, photography and online advert. Identify areas that can be improved, and make sure they are acted upon. 7. Why hasn’t our house sold – other than the price? – I have often asked agents this question, and listened to them trying to come up with an answer. The truth is, there are often several reasons, and it’s highly likely that none of those reasons will be the asking price!Ask your agent for constructive ways you can help him to attract viewers, and make sure he knows he can be honest. Looking forward to hearing from you.